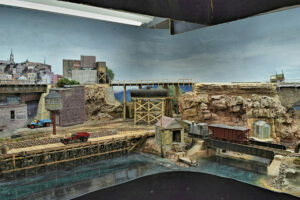 By 2016 the layout was becoming pretty well finished (I thought). Here we can see Wise Engineering Works on the far left (scratch built). Just to the right is Widget Supply Company (scratchbuilt). The two buildings below the bridge re unnamed .. the brick structure to the front was supposed to be a barber shop but never got as far as getting a sign. The brick building on the far right is a Clever Models kit. The tower overlooking the pier is scratchbuilt. Center we have a scratch built tank car acting as a .. well .. tank. Originally I was going to use it as a water tank but I am undecided at this point (or just sleepy). Jukes Boat Livery (Clever Models) is lower center. 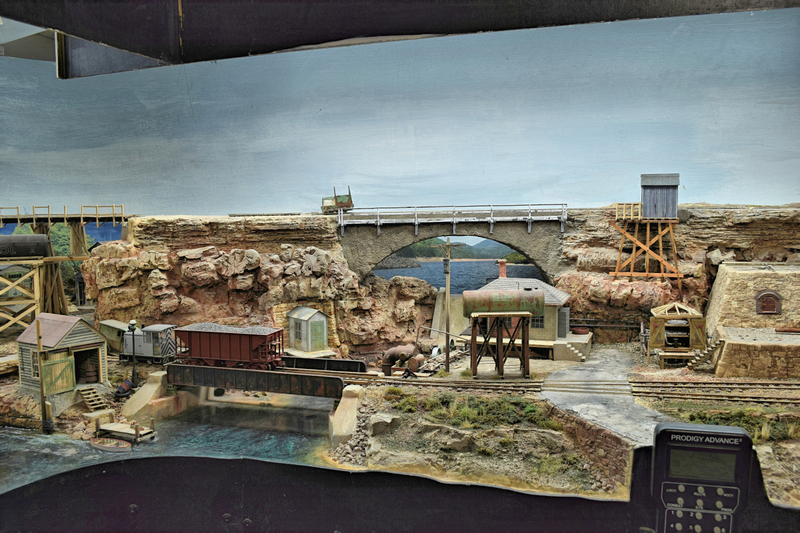 The bridge with the ore car was scratched from a HO bridge. 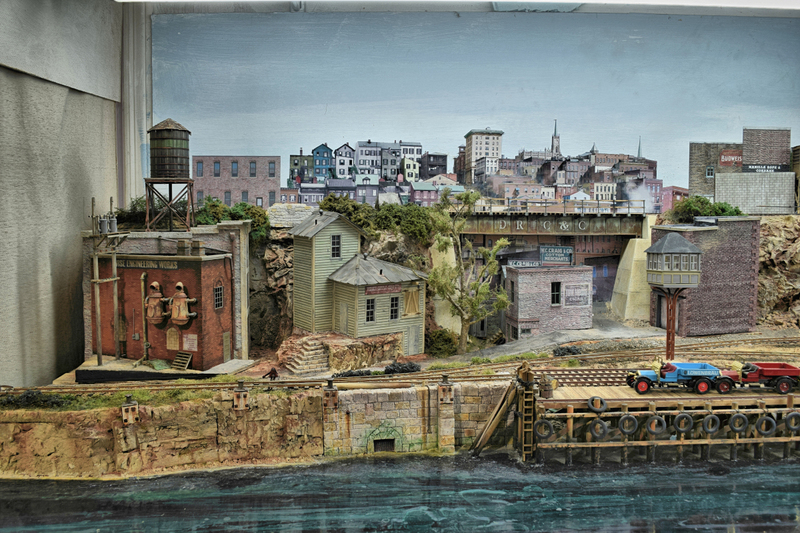 The little building in the back (pump house) is a Shanty #1 from AM Models. To the right of the bridge you can just barely see the small damn – just behind the pump house. A turbine lurks between and forward a bit. There is another elevated tank for oil near the track. To the right we have a Clever Models Yard Shed up top along the on18 track, my Fire Hose House (B&O) below and just a bit of the coke ovens showing. 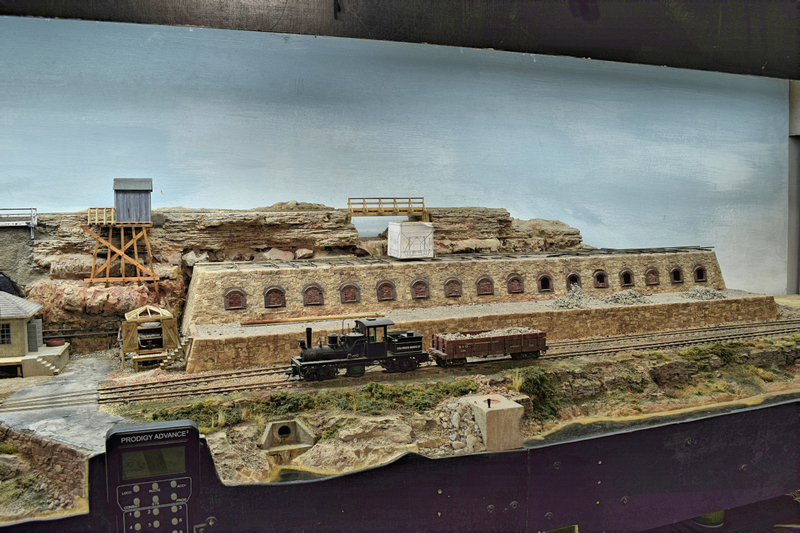 Up top is a small scratch built wooden bridge carrying the On18 track and below my scratch built coke oven.